P.Zed1 Myers gave a wonderful talk last night. He and his daughter Skatje arrived at 2pm and we had time for snacks and drinks at the Faculty Club before he was whisked off to the Center for Inquiry for a reception at 6pm. About 10 fans joined us at the Faculty Club. Here's P.Zed just before his talk with Justin Trottier, Director of CFI, Ontario and Katie Kish, Assistant Director. 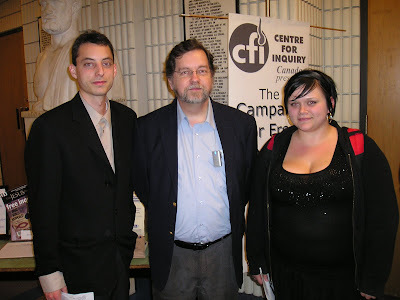 I'll try and get another picture of PZed with Kate Fairbrother, President of the University of Toronto Secular Alliance. Here's a fuzzy picture of P.Zed describing the Cracker Affair. There were about 500 people in the audience including some of your favorite bloggers and regular commenters. Canadian Cynic was there but he/she was well disguised—after all, it was Halloween. My friend, the Jesuit priest, was there. I'll be anxious to find out what he thought of the cracker desecration! 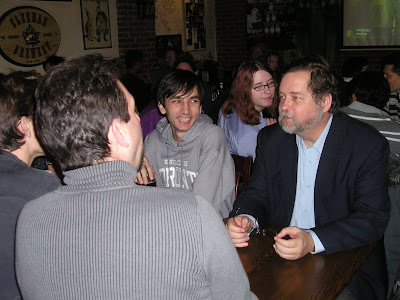 After the talk, about 30 people joined P.Zed and Skatje at O'Grady's Pub for a glass of water. Here's P.Zed talking to some of the people who came out to see him. That's Skatje in the background. P.Zed tells me that he prefers the English version of his name to the American version (P.Zee) because the English version sounds so much more sophisticated. I attended the talk, and found it pretty disappointing. He had a full audience predominated by the educated godless, but gave us a pretty bland rundown of the creationism/science fight in the States. P.Zed also allowed continual questions and interruptions from the floor, which made for no flow or momentum to the speech. The high point was his comparison of religion to masturbation. I loved the final comparison - "enthusiasm for the practice does not render one fit for higher office". He writes with more passion than he speaks. I enjoyed the talk ... I think it is hard to compare writing and public speaking, in some ways. Certainly, even though PZ was "preaching to the choir" (LOL! ), I was engaged the entire time. As PZ himself mentioned, the data he discussed were mostly American. It would be nice to see Canadian stats on some things ... 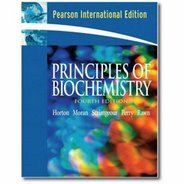 Does anyone know if there have been studies on teaching of evolution in HS Biology, etc? 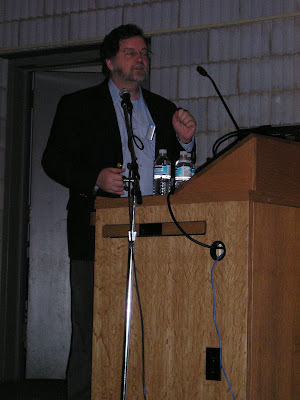 I enjoyed the lecture, but more for the fact that it was PZ presenting, whose blog I enjoy immensely. I agree with Tanya in that it was definitely "preaching to the converted". I would have liked to have seen people in the audience who were opposed to his views, and for them to have taken part in the Q&A. don't vote for the SHAM DEMOCRACY! Aughh I missed it! Oh well - not like Universities ever run out of beer. I'll sign up for an account later.. so I don't come off as some anonymous idiot. The choir wasn't full of singers - let me make that clear. One of the people that came with me and two of the people sitting beside us were from the other side! PZ dismantled the "religion doesn't interfere with education" from the "what religion does is teaches kids to stick their fingers in their ears, so it doesn't matter what we try to teach them" stand point. The person that came with me, is not (yet) anti-religion but does have a newfound respect for what the battle REALLY is. He even called me this morning to say that he is going to educate himself more on science so he can better educate his children - he wouldn't go as far as taking his kids out of church because they have many friends there. The two beside us were confident, before the talk, that their kids would be smart enough to educate themselves and make good decisions based on what they were presented. When I asked, at the end of the meeting, what they thought, she said "kids are smarter than he gives them credit for" - implying that you can't indoctrinate kids! Great work PZ - your talk was wonderful. Thank you Larry! Toronto is so hard up for tourist dollars, they'll even host this Moron convention. Pretty good talk but the crowd let him off pretty easy in light of some of his statements. Not saying he was necessarily wrong but his views aren't quite mainstream. He could have been called out on a few things. For instance, the masturbation quip was cute but it has the tone of religion being harmless. Later, he used switched to using much less civil words.